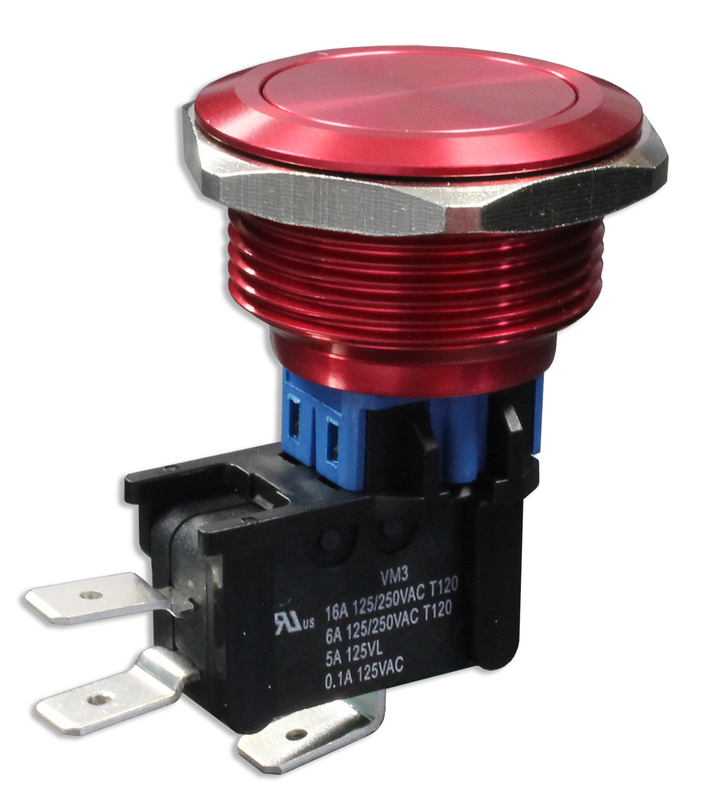 Offering size options of 25mm, 28mm and 30mm standard, the UL approved DHU Series combines the LED illumination and metal body of the DH Series with the UL recognized switching capability of the VM3 Series snap-action switch. Being both vandal and splash resistant, this panel mount switch is heavy-duty and rugged in construction. The DHU Series is available as momentary or latching. Flush actuator styles offer non-illuminated, bi-color ring or dot illumination or the International Standby symbol. Mushroom style actuators are also available in red anodized aluminum. Illumination color choices are red, yellow, green, blue, white and orange. LED voltage choices range from 6V to 220V. Wall plates are available in brushed aluminum and colored anodized brushed aluminum in three different sizes.